Restore formatted PC Disks, Memory Cards & USB. 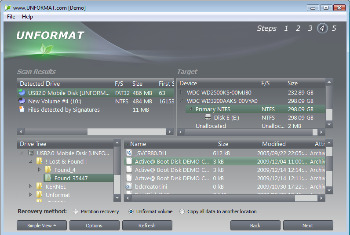 Unformat portable is a software utility created to solve almost all data loss scenarios due to logical failure. It can recover deleted files on a disk or restore deleted or damaged partitions and volumes. As well as recovers data after using the FORMAT command. – Memory cards accidently formatted in all cameras, smart phones, MP3 Players, etc.